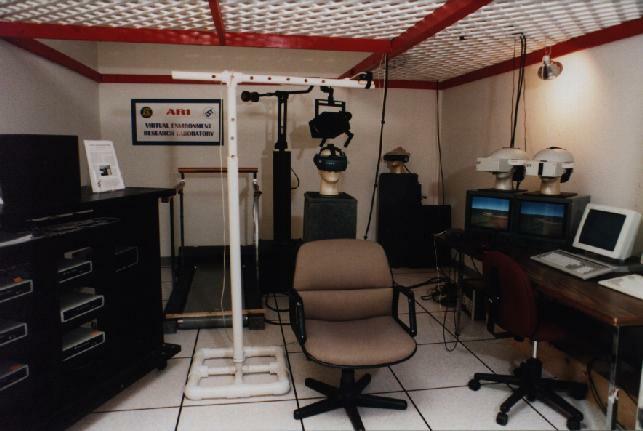 The Army Research Institute Virtual Environment Testbed was created at IST as a platform from which to conduct human-factors psychology experiments to evaluate the potential of Virtual Environment technology for use in training. A wide variety of display and tracking devices have been employed in the development of high-performance simulations designed in cooperation with researchers from the Army Research Institute. These simulations have been used to measure human cognitive abilities in computer-generated environments ranging from basic components of vision, such as perception of lines and colors, to higher, more complex skills, such as navigation through a labyrinthine office building. The Virtual Environment Building was developed for the second phase of the project in order to measure the amount of transfer of route knowledge gained in a Virtual Environment to real-world navigation tasks. This high-fidelity model of an actual office building grew into one of the largest Virtual Environments ever created, consisting of over 40,000 textured polygons that are dynamically paged and managed by an extensive software system. Preliminary results seem to indicate that training gained while in the simulated building has a great deal of real-world validity. One of the goals of the ARI project is to examine different display technologies and their impact on performance in the Virtual Environment. To this end, studies have been conducted on both networked personal computers and high-end graphics workstations using traditional flat-screen monitors, head-mounted display devices, and a high-resolution two-color BOOM. Other paths of investigation involve an optimal head and body tracking solution, and better means of locomotion ranging from specialized joy-sticks to a walking treadmill. Future research for the project includes the development of an extensive outdoor environment that will incorporate advanced Dynamic Terrain features developed at IST as well as other high-performance features such as three-dimensional convolved sound and multiple networked participants with full-body tracking. With projects such as the ARI Testbed, IST is leading the way toward the development of truly immersive, networked computer-generated training environments. Back to the Visual Systems Lab homepage.